The Verge revealed last week that Microsoft wants to create a "new and disruptive" dual-screen device category to affect the overall Surface Roadmap and unclear lines between what is considered PC and Mobile. The code name Andromeda, Microsoft's project has been in development for at least two years and is designed to be a flashlight Surface device. Last week, Microsoft's Surface Chief, Panos Panay, discovered a foldable dual-display device in collaboration with LG Display. 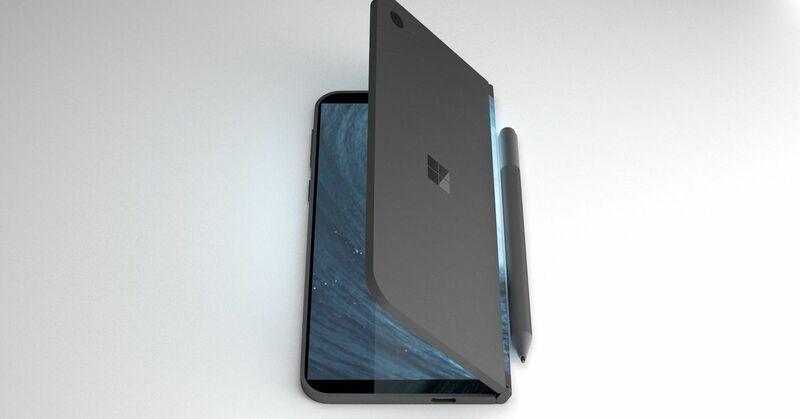 We are about to see the release of a foldable, two-screen tablet-like device that Microsoft has actually dreamed of for almost a decade. The original source of many Microsoft's ambitions was a unit called Courier. The secret incubation project was designed to be a digital display, evolving at the same time as Apple's iPad. "Courier really was about building the bridge between the analogue world and the digital world," explains Jon Friedman, now chief designer of Office 365, in a chat in Microsoft Build last month. Concept videos and pictures of Courier leaked show a dual-screen device with ink and touch support. While Courier is an obvious inspiration for Microsoft's latest Andromeda experiment, the software vendor has suggested that this type of device in its "future productivity" vision videos. The latest video, three years ago, shows multiple devices with two screens that fold and override to convert from a phone-like device to multiple of a tablet. These concepts are similar to the type of device used in Westworld where multiple screens with small divisions are folded out to create a larger tablet or collapse into a more handy phone format. Microsoft's previous conceptual videos have revealed the company's future surface products fairly accurately. Surface Hub 2 is the manifestation of Microsoft's obsession with large-scale touchscreens, and even Surface Studio and Surface Dial devices were shown in the same concept video. Flexible monitors and folding phones are still a few years away from the usual, but it is clear that Microsoft has been waiting for this type of future device for a while. 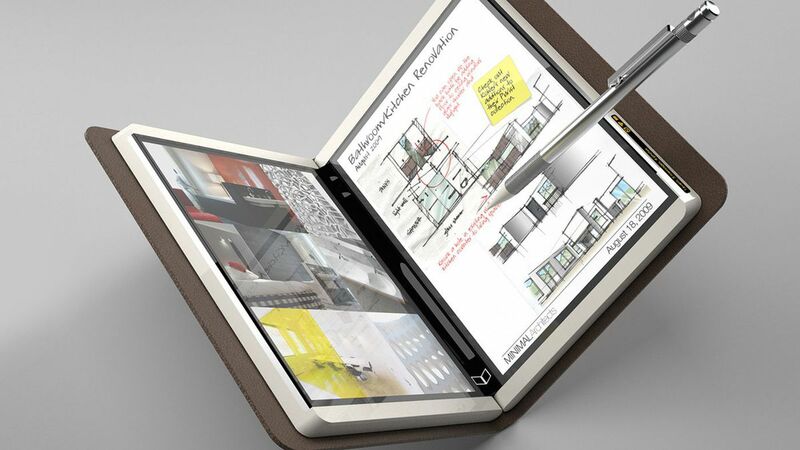 Microsoft's foldable phone and tablet concept. Samsung has also wondered with the idea. The Galaxy producer gave its own conceptual video of a future signal back on CES in 2013, and has invested in curved and folding screen technology ever since. Samsung recently began to market folding screens as a source of new revenue, which indicates that we can be very close to a device shipment. The LG Display also works on TV screens that roll up as a newspaper. Unfortunately, this vulnerable display technology is unlikely to be available for purchase yet. But less ambitious design can help blend the two separate screens together on two screens in the short term. It is an important element for any display device: makes it look like a single tablet screen when unfurled. Samsung Concept Phone from 2013. Whatever company is capable of bringing a compelling dual-screen device to the market first, will need to avoid the mistakes in previous attempts. Sony's Tablet P tried to make two monitors, but was turned down by untimely apps and giant decorations that ruined the experience. More recently, ZTE's Axion M has given us an early look at the future of these two monitors, but again the software and app support have been missing. Microsoft must really make sure the software works well enough to realize its dual-screen device dreams. Creating apps scale over ever-changing display sizes and formats will be the hardest challenge for any hardware manufacturer to succeed. But if a company succeeds, we can witness an interesting time with smartphone and tablets.